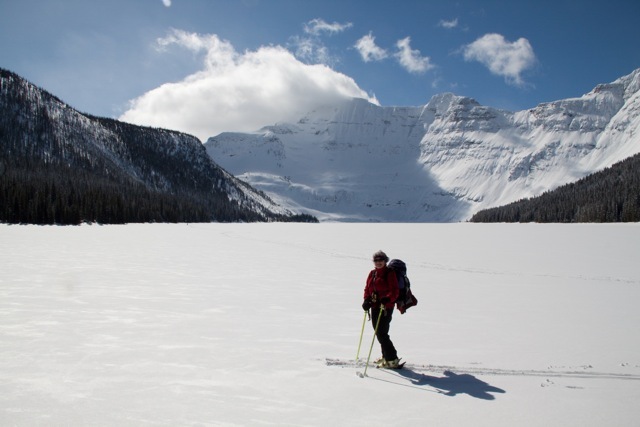 Banff’s Kathy Madill enjoys a perfect day on Cameron Lake, one of the Rockies’ best x-country ski destinations. Credit: Chic Scott. The Akamina Parkway, which runs for 16 km from Waterton townsite to Cameron Lake in Waterton Lakes National Park, suffered serious damage from a major storm on June 19. Several washouts and roadbed collapses forced closure of the road for the remainder of the summer and rendered some of park’s most popular hiking trails inaccessible. 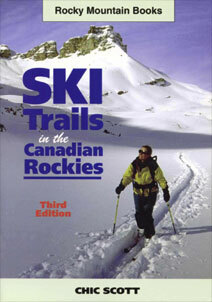 (See Hiking Trail Update for Waterton Lakes National Park on this site. ) But following five months of major repairs and road reconstruction, Parks Canada was able to reopen the road on November 30, just in time for the winter season. There are still some rough patches on the road, and vehicles are forced onto a short section of single lane traffic at km 3.4. As a result, expect brief road closures next spring so work on this section can be completed. Meanwhile, skiers have been making their way to the Little Prairie trailhead near the Parkway’s southern terminus to enjoy the track-set trail to Cameron Lake—one of the best short trips in the Rockies. Little Prairie is also the jumping off point for another novice-intermediate trip over Akamina Pass to Wall Lake.